During English era in Cyprus, only few were tennis fans and played at Famagusta Tennis Club. Tennis was almost an unknown sport and the few players were concidered crazy, because during winter they walked down the streets wearing white sports clothes and holding wooden racquets and white balls. The first tennis court was built in the early 1920, and was located opposite the small forest across the Jury Courts of the city and was concidered a privilege for the English. 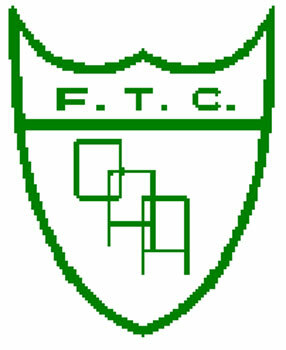 In Cyprus, few are the Clubs that have been established over 80 years ago. Famagusta Tennis Club (FTC) was established in 1925 by a group of youngsters, who decided to build a tennis club, wanting to bring something new in those days with the purpose to pique the interest of others. The first greek tennis club in Famagusta had the name Salamis Tennis Club and the first Committee Members were represented by Mr Andreas Michaelides ( President) Michalakis Hadjedemetriou(General Secretary) and Mr Saveran Saveriade (Treasurer). These youngsters, were offspring of well-known families in the society, english speaking and their families had connections with England. Therefore they built their first tennis court by cement at the place where nowadays the magnificent building of Lyceum for Greek Women is situated and occupied by the Turks. The Club had 100 members. 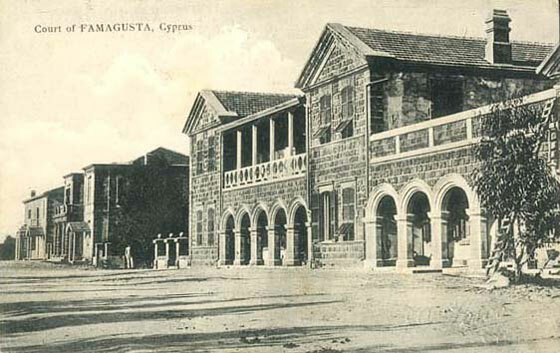 THE FAMAGUSTA LYCEUM FOR GREEK WOMEN WHERE FAMAGUSTA TENNIS CLUB WAS SITUATED. 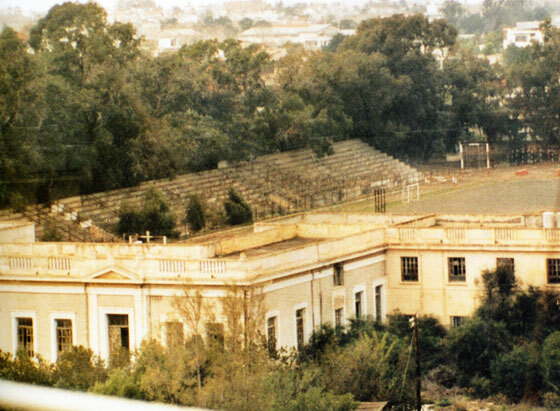 Until 1940, the Tennis Players of this Greek Salamis Tennis Club, competed against the English Tennis Club. During 2nd World War, all activities were suspended due to Greece going into the war and Italian aircraft started bombing Famagusta. At the end of the war in 1945, a period of reconstruction began. The 25 Members of Salamis Tennis Club at the Annual General Meeting, voted and elected the first post war Committee represented by Mr Sotos Hadjisoteriou (President) Dinos Panayiotou (General Secretary) Nikos Fialas (Treasurer) Fanos Theodotou and Andys Kouzaris (Members). During the 1950s, the Club was established as the center for events. The Committee, with the reactivation of the Club, tried and succeeded to give access to the public and the youngsters to play the sport. It had renovated the first court and built a second court made by premix on the east side of GSE. The Club suspended again its activities in 1955 when the Cyprus Liberating struggle began against the English. At the end of of the struggle in 1960 the club was again without courts because by then the Club for the Lyceum of Greek women was built on the first court and the second court was destroyed. 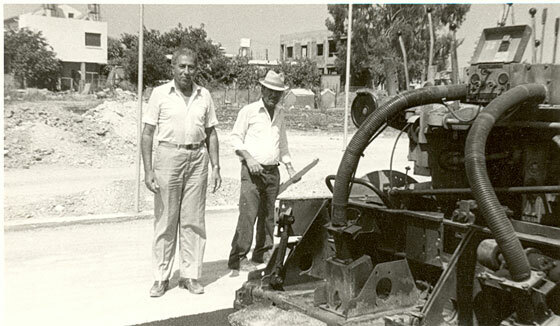 In 1960 while the Municipal Board of Famagusta was studying the erection of a Municipal park in front of the A' Greek Gymnasium, the General Secretary of Famagusta Tennis Club Mr Dinos Panayiotou had a vision to make Famagusta Tennis Club the center of sport and the core of civilisation for the city of Famagusta. Therefore very quickly his vision and faith that Famagusta Tennis Club would become an institution unchanged throughout the years was easy to take roots. So he sent a letter to Famagusta Mayor Mr Andreas Pougiouros who was known for his modern ideas about progress asking him to find a place in the Park to build the Club. Mr Pougiouros answered back and confirmed that the Municipal Board had the intentions to build tennis courts in the future in another place. The aim of the Committee now was to teach the sport of tennis for the Pancyprian and International Tournaments. Therefore a high standard coach was called Mr Panos Neophytou, whose great results had shown in short time at the Pancyprian tournaments and had won the applause of all. The Field club coach Mr Gordon had praised the juniors Giorgos Dinou Panayiotou and Naki Pampou Toumazi for their results. The residence of Famagusta Tennis Club inside the occupied city of Famagusta today. With those positive results the Committee represented by Mr Pano Hadjihambi (President) Naki Christodoulidi (Vice President) Dino Panayiotou (General Secretary) Mikis Palmyris ( Treasurer) Andy Skordi Rita Kyriakidou and Giannaki Stefanidi (Members) planned the descent of a foreign coach, but the barbaric turkish invasion in 1974 came and the Club fled to safety to Limassol and became refugee like another 200,000 Cypriots. Dead, missing people and refugees, the hurt and the cries. But crying didn't give you any more benefit. Famagusta Tennis Club dried up its tears lifts up its head and moves on. Now it has another purpose to exist, to fight to be distinguished. The loved city awaits it. 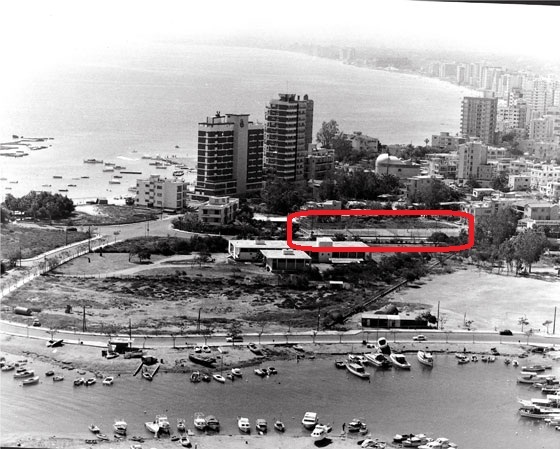 In Limassol there were Hotels and Sporting club. But the effort is very difficult. Diffiuculty though is for winners. 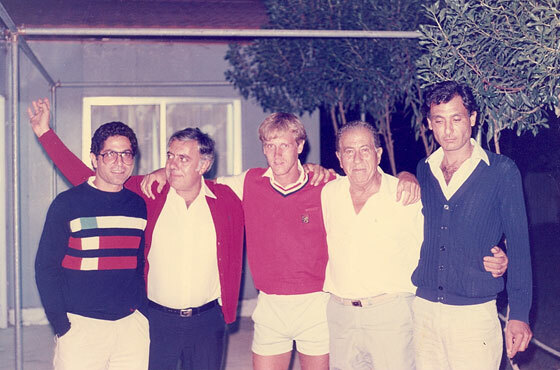 After the Club's refugee in 1974 by coincidence six Members of the Committee met in Limassol. As a first step the Committee contacted Sporting Club for hospitality and cooperation for the good of the sport. Unfortunately this wasn't possible because Sporting Club asked them to become Members. Of course this proposal was refused and the President Mr Dinos Panayiotou immediately started works and continuous correspondece and meetings with the President of Cyprus Mr Spyros Kyprianou, the Cyprus Tennis Federation, the Cyprus Sports Organisation, Ministers and other Officials asking them to reestablish the club. Time passed unfortunately without anything positive and the Members started leaving saying that it would impossible to reestablish the Club again. The only Member who stayed with the President was Rita Kyriakidou and in 1979 they organised a dinner dance at Miramare Hotel in Limassol and raised 3,500 euro for the Club. 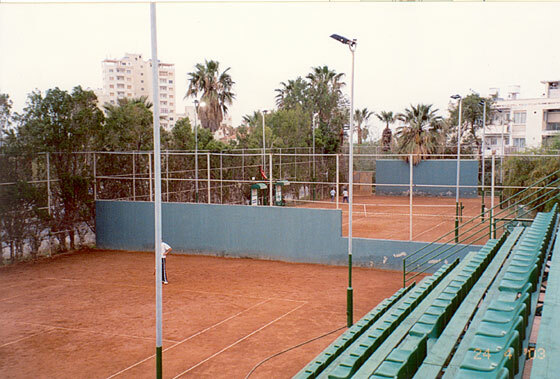 It goes without saying that Famagusta Tennis Club in Limassol was built by the late President Mr Dinos Panayiotou. In 1980 Mr Adonis Papadopoulos gave financial aid at the Club and the Committee proclaimed him as the Beneficiary Member of the Club. The honoured Member Mr Adonis Papadopoulos at the opening of the Club. In 1982 the club creates its temporary office. From here it will begin its wide path that leads to the top of cyprus sport. Famagusta Tennis Club is again the main protagonist, like the mythical phoenix reborn from its ashes, the Club with a small group of people at the Committee Mr Dinos Panayiotou, Rita Kyriakidou, Elenitsa Mattheou, Loui Savvide, Pavlo Iakovou, Antoni Toumazi and Lia Artemi, craving for creation and the energy they possesed, with the love and support they had from people of Famagusta, with the active support of Cyprus Sports Organisation through its President Mr Kiki Lazaridi and Cyprus Tennis Federation through its President Mr Filios Christodoulou all worked hard and the Club was reborn. 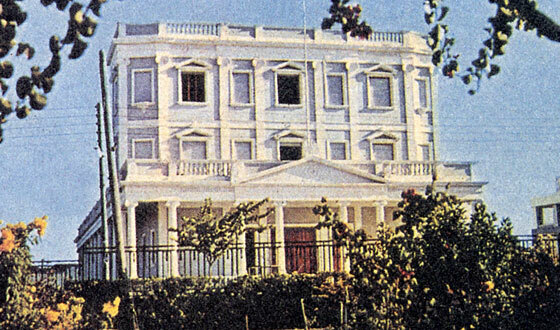 On the 1st October 1982, the Committe, gave its members in Limassol, two tennis courts made by premix fully floodlit on the Nikou Pattichi west avenue, as well as later its own building on the Turkish Cypriot land through the agreement for lease and concession that was achieved with the Management Committee of Turkish Cypriot properties and with the help of the President of the Club Mr Dinos Panayiotou and the Member of Parliament Mr Alexi Galano from Famagusta. Simultaneously, an Egyptian coach named Kamel Hassan was called to undertake coaching duties and thats when the great path of success began. 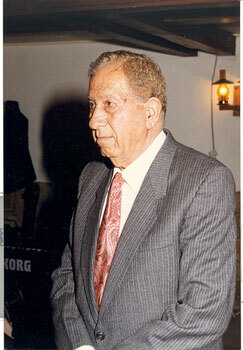 The late President Mr Dinos Panayiotou oversees the construction of the courts. In December 1982, the Committee, proclaimed Mr Alexis Galanos Honourary Member to express its thanks for his help. In 1983, after the deportation of the Egyptian coach, the Committee hired Mrs Eleni Pilava who worked hard and with zeal for the athletes progress. Simultaneously Mrs Sherley Tomson a Member of the club volunteered to provide her services. In 1984 the Committee proclaimed as Honorary Member Mr Andreas YIannakou, the ex Limassol District Official to thank him for his services in giving the land for building the Club. The wide path towards rise and progress of the Club was without question the achievement of Mr Dinos Panayiotou and the Members of Committee who undertook the inititative and managed to build modern facilities, in a sporting shelter, entertaining and relaxing, away from traffic and noise and with great respect towards the natural environment in the Center of LImassol. This was managed through the financial support of Great Benefactors of the Club Mr Adoni Papadopoulo, Eden Hermann, Stelio Mandridi, Frixo Tsakkisto, Kosta Kythreoti, Ioannou and Paraskevaidi, Aki Lordo, Vasso Hadjitheodosiou, Anreas Kaittani, Niko Sarri, Tymvios Bros, Elenitsa Neofytou, Kosta Kassino, Foto Fotiade, PK Ioannou and Sons, Nissi Beach Hotel, Chrysostomou Bros, Kanika Company, Niko Fiala, Mbahala Siaili, Niko Protopapa, Steven Heinz, and others as well as the support from Cyprus Sports Organisation. 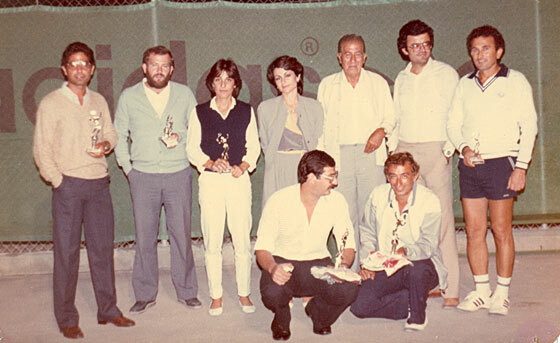 In 1984, the Committee, consisted by Mr Dino Panayiotou ( President ) Andreas Christou (General Secretary) Kyriako Zisimo (Trasurer) Lia Artemi, Kris Georgiadi, Giorgo Fiala, Rita Kyriakidou and Aleko Koliandri (Members) hired the talented Belgian tennis coach Tierri De Donker and was concidered great success for the future development of the athletes. The Coach Tierry De Donker with the Members of the Club Petros Demetriou, Andrea Tritti, Dino Panayiotou and Dino Papadopoulo. The honorable Sarris Family benefactors of Court no 2. 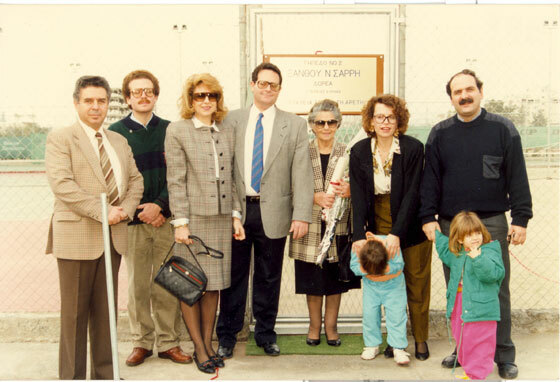 In 1986 the Committee consisted by Mr Dino Panayiotou ( President ) Aleko Koliandri ( General Secretary) Loui Savvide (Treasurer) Lia Artemi, Andrea Christou, Rita Kyriakidou and Kypro Kyprianou (Members) with the financial support of Cyprus Sports Organisation, proceeded to build another two courts to cover the increasing demand for courts by its Members.Then followed the courtyard being cemented and a car parking place was created. 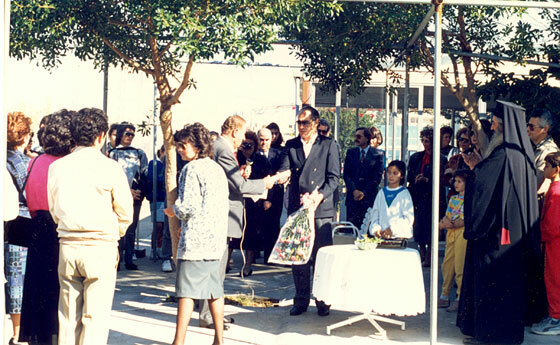 The same year the Committee proclaimed Cyprus Sports Organisation as a Great Benefactor. The ex President of Cyprus Sports Organisation Mr Ouranios Ioannides at the Grand Opening of Court no 1 which was donated by Kostas Kythreotis family. In the photo Mr Dinos Panayiotou, Dean Nikolaos Sideras, Limassol District Andreas Aggelides, Loukis Savvides, Pantelakis Kyriakides, Rodion. Panayiotou, Stavros Ioannou Andreas Kaittanis and others. In 1987, Famagusta Tennis Club wins for the first time the Interclubs Tournament in the Ladies category with Mari Misirli and Jean Robertson. The same year the Committee declared unanimously the Honorable Member Mr Adonis Papadopoulos as Great Benefactor whose continuous big contributions switched him from Benefactor to Great Benefactor. In 1988 the Committee consisted by Mr Dino Panayiotou (President) Stavro Ioannou (General Secretary) Giorgo Severi (Treasurer) Mari Misirli, Rita Kyriakidou, Heleen Florentiadou and Christo Christodoulou( Members) hire a great Czech coach named Pavel Vravel who greatly contributed in the progress and development of the club's sports team. This was achieved with the construction of another three tennis courts bringing the total number of courts to 7 thus serving the members and simultaneously having courts for training. 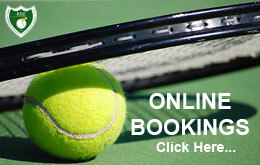 In the late 80s tennis cultivation began systematically for the sporting youth of the island . starting a big effort to upgrade the Club. Thanks to the work done not only by the President Mr Dino Panayiotou but other Members too gave a lot of effort like Mrs Rita Kyriakidou, Mari Misirli, Lia Artemi, Andreas Christou, Helen Florentiadou and Kyriakos Zisimos who volunteered and put their own stepping stone for it to become Famagusta Tennis Club but most important to the children academy ( where european methods were used). In July 1980 the club's tennis players Marinos Baghdatis and Persella Ioannidou, were chosen from the Cyprus Tennis Federation to represent Cyprus in the European Championships that took place in the then Soviet Union. 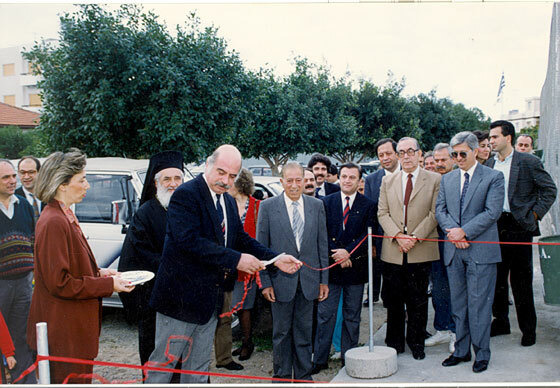 In 1990, the 8th tennis court was constructed donated by Kostas Kythreotis (Kythreotis concrete). Simultaneously another Famagusta company Sarris family undertook with its own expenses to renovate and refurbish an existing tennis court with plastic grass. 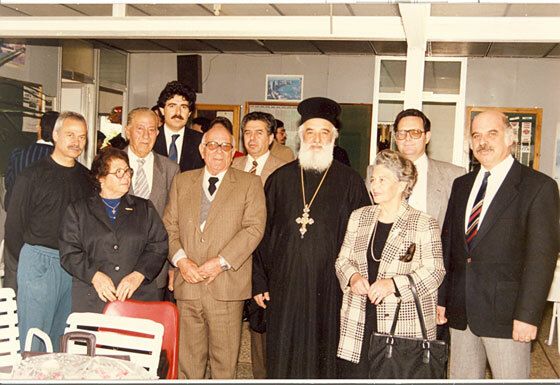 The Honoured Mr Kostas Kythreotis, Mrs Elenitsa Neofytou with Mr Nikolao Sidera, Andrea Aggelidi, Ouranio Ioannidi, Dino Panayiotou, Stavro Ioannou and others.